It's Sunday night and I'm watching The Husband watch Football. There's nothing new on TV that I care to watch. I mean, my go to channels are Food Network and HGTV but I don't really cook and we live in an apartment so...there's only so much of that you can watch. And I don't know about you all, but I'm ready for some Fall TV. 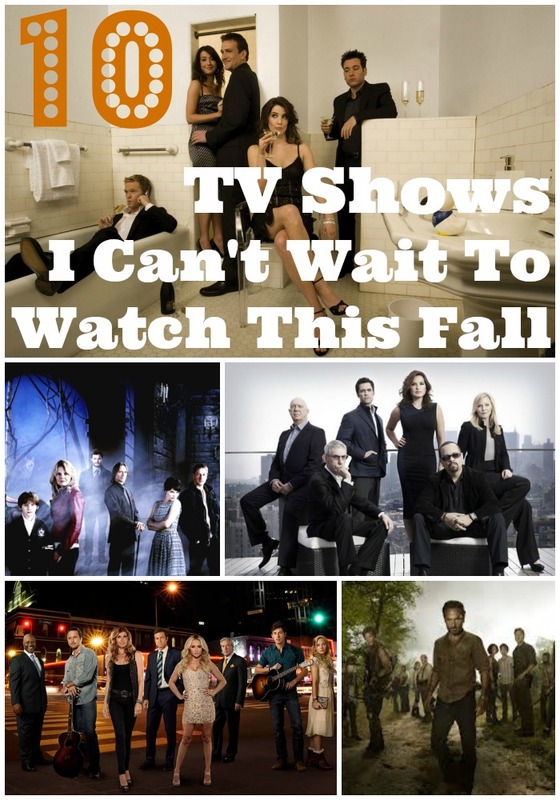 I've been ready for weeks if you must know and here are my Top 10 TV shows I can't wait to watch this fall. I am only talking about shows that I know and love. Honestly at this point, I can't commit to watching a new show. How I Met Your Mother. It's one of the few shows The Husband and I enjoy watching together. And I don't know about you but I'm so ready for Ted to meet the "Mother." It's time. It's actually a few seasons over due but whatever. New season begins Monday 9/23 on CBS. Law and Order: SVU. Because what's going to happen to OLIVIA! I don't think I can handle it. New season begins on Wednesday 9/25 on NBC. Nashville. You know what...don't judge me. I like this show. A lot. It's a captivating storyline and the singing/song writing is spectacular. If you haven't gotten into this show by now. You should. There's time to catch up. You won't be sorry. New season begins on Wednesday 9/25 on ABC. Modern Family. I have a serious girl crush on Sophia Vergara. And the show is funny as sh*t. And it's a another show The Husband and I enjoy watching together. I suspect he may like Sophia too. New Season begins Wednesday, 9/25 on ABC. Glee. When Cory Monteith (Finn) died earlier this summer, I cried. And as much as I can't wait for the new season to start, it's going to be hard to watch without Finn. I love Glee for so many reasons. But I love it because it reminds me so much of high school...well not my high school but the high school I would have liked to attend. And just between us - I like singing along to the songs that they cover. Sometimes I even get up and dance. I'm just kidding. I don't really dance...or do I? You'll never know. New season begins on Thursday 9/26 on Fox. Big Bang Theory. Sheldon. Period. New season begins on Thursday, 9/26 on CBS. Parenthood. Sigh...I have a love/hate relationship with this show. I really really do. I love some of the characters and some of the characters annoy the crap out of me. And I love that there's a character on the show with a form of autism but I kind dislike how they handle it. New season begins on Thursday, 9/26 on NBC. Once. I cannot stop talking about this show. It's so good! If you love fairy tales, you'll love this spin on all of your favorite stories and characters. What I really appreciate about this show is seeing a different aspect of the tales I grew up with. Everyone has a backstory, Once, not only explores each characters backstory but it takes them to a whole new level. New season begins on Sunday 9/29 on ABC. The Walking Dead. And this is the show that just pisses me off. I mean, I watch this show and I am literally yelling at the TV screen. HOW COULD THEY BE SO STUPID!? And Andrea...I was so happy when they killed her off the show. I was over her. But you know who I live for on this show? Daryl (Norman Reedus) - he's one of my favorite characters on the show and I can't to see what happens this season. New season begins on Sunday, 10/13 on AMC. Downton Abbey. I know, it's not fall TV. But I am having serious Downtown Abbey withdrawal. I've started watching it from the beginning. I won't go on anymore...just watch the trailer for the upcoming season. New season begins on Sunday 1/5/14 on PBS.